Glasstrends has been recently commissioned to design, manufacture and install frameless glass in all shower areas of the 25 luxury apartments, at award winning residential development designed by Sir Robert McAlpine, Cheyne Terrace. This residential scheme just off King’s Road, Chelsea has been designed to meet the demands of even the most discerning clientele. 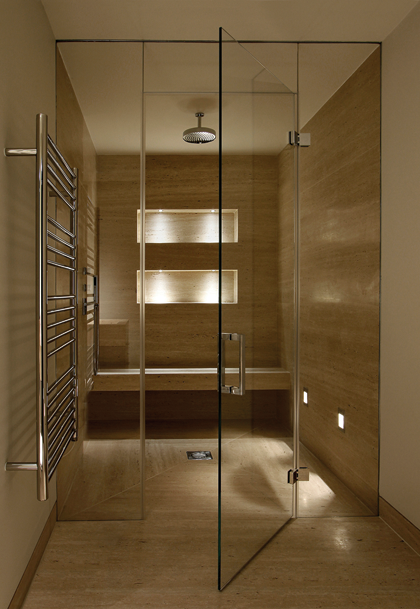 Using floor to ceiling frameless glass, with cleverly concealed fixings and completely clear low iron glass, each shower area seamlessly blends in with the rest of the bathroom creating an elegant and harmonic setting. The completed look is clean, stylish and sophisticated, giving a feeling of space and calm. An independently owned boutique company of 15 years, Glasstrends use their practical yet imaginative design and unique methods of manufacture and installation to help interior designers bring their ideas to life. Designed for any space, made to any size, with a whole range of options, colours, finishes and even textures - for bathrooms, wet rooms, poolside, wine rooms and more - the opportunities really are virtually limitless.